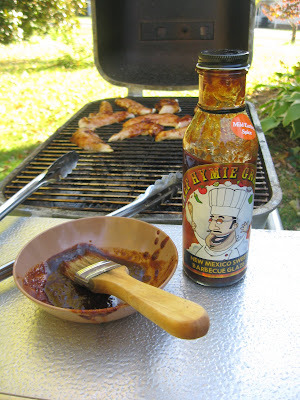 I fired up the PK charcoal grill to try out my latest barbecue sauce - Chef Hymie Grande. His barbecue sauces caught my eye, because they are the first to carry the American Diabetes Association seal. Although, I do not have diabetes, I have high tri levels and some family memebers with diabetes. Gotta keep an eye on that. 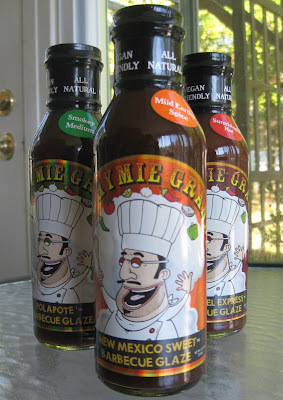 Chef Hymie Grande barbecue sauces are vegan friendly. I am very not vegan as anyone will know who reads my blog or web site Yes You Can Grill. I aim to please though, so it would nice to have a good vegan barbecue sauce in the arsenal though I slathered mine on meat, of course. Chef Hymie has three barbecue sauces out and a ketchup coming up soon which I look forward to trying out. The one I'm using on this grill time is the New Mexico Sweet Barbecue Glaze which is billed as having a "mild, earthy flavor." He also has a medium and hot version (and I do love hot). I've heard people say that Chef Hymie barbecue sauces taste kind of smokey, and that always makes me nervous. I've had way too many barbecue sauces and dishes with fake smoke added, and I must say that Liquid Smoke tastes like . . . well . . . Liquid Smoke. It's kind of like plastic flowers. They're OK I guess and have a place on the market, but I'd much rather have real than fake. Since the Chef Hymie Grande sauces are all natural and don't even include high fructose sugar plus are made in small batches, I quickly set those worries aside after reading the side of the bottles. But, it's still all about the taste. So, even if it's a good idea, the barbecue sauce has to pass the taste test to survive around this house. Chef Hymie barbecue sauce is medium as far as texture. It's not as thick as Kansas or Texas barbecue sauce, but it's not thin (and made as a mop sauce) like many North Carolina pork barbecue sauces. Also, the color is darker than the typical barbecue sauce, so don't think I burned my barbecue chicken. I didn't. Trust me. I seldom do that, and when I do, the dog is very happy. I brushed Chef Hymie Grande on the boneless chicken strips right near the end of the grilling time. 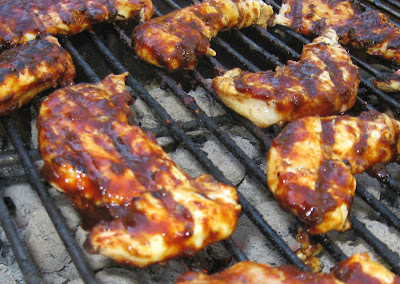 That's one grilling mistake many folks make - using barbecue sauce as a marinade or rubbing it on too soon. Sauce goes on the last five minutes or so - just enough time to heat and set the bbq sauce. Everything looked great, and Chef Hymie bbq sauce smelled fabulous. But, again, it is all about the taste. I had to taste test the grilled chicken, and . . . wow . . . great stuff. I was sure Chef Hymie had a hit with his new barbecue sauces. I never say that though. I served the grilled chicken up, and the kid and the dad-person both thought Chef Hymie Grande sauce was a score. I hold it neutral until I get reactions from the family and friends. But, I usually nail it. While I don't normally think of New Mexico as a barbecue sauce state, I'm giving that second thoughts. I adore Chef Matt's sauces out of Arizona (close), and Chef Hymie Grande ranks there with the best. I feel a road trip coming on, but New Mexico/Arizona sure is a haul. The barbecue sauces are great though, so I may have to put that on my to-do list. If you want to check out the sauces, then see Chef Hymie Grande sauces at Open Sky. He really does have top notch barbecue sauce. I'm very impressed. I had some friends over and we taste tested the Chef Hymie BBQ sauce about a month ago. Everyone gave this one a thumbs up! Yep. Same here. I did not have anyone on the fence. Chef Hymie Grande made the grade here in North Carolina even though it is not a NC type bbq sauce. Good is god, and this barbecue sauce is. I never hesitate to recommed Chef Hymie Grande and love that a barbeuce sauce finally got the American Heart seal of aproval too.